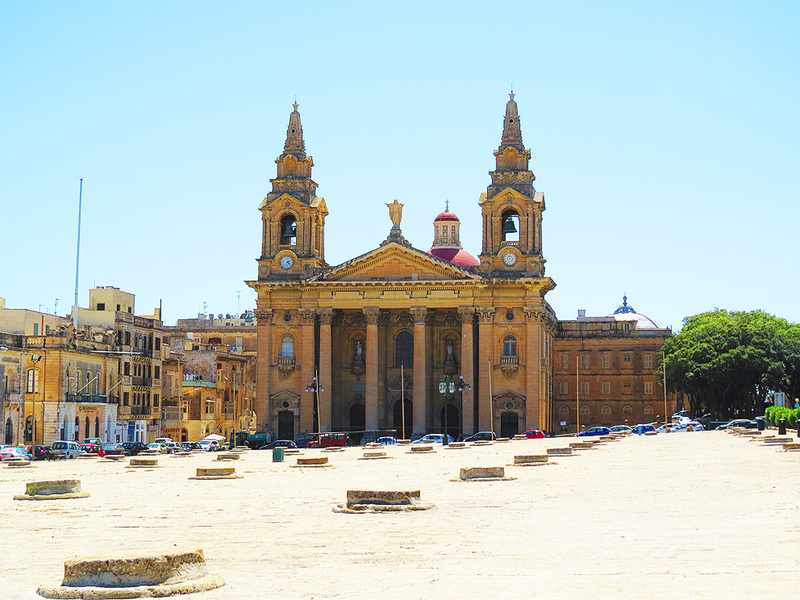 The largest public square in Malta is the one in front of St.Publius church in Floriana. It is not the prettiest of open spaces but it has proved essential for Malta’s survival in the past and is now more of a large stage for mass events. In Malta the square is known as ‘il-Fosos’ which roughly translates into the somewhat undignified ‘the pits’. The British gave it the more respectable name of The Granaries. And as granaries this space has actually served for hundreds of years. The storage of cereals underground dates back from time immemorial and in Malta this was a practice of the Bronze Age people who settled the Islands after the collapse of the Temples civilization. Shallow grain silos are in fact one of the giveaway signs that an area was inhabited in those far away times. Granaries were among the first constructions undertaken by the Knights of Saint John on taking possession of Malta in 1530, and six of them had been excavated in Birgu by 1538. The Maltese islands being as dry then as now it was important that a good supply of grain was always at hand…and the Knights were all too aware that a long drawn out siege was a likely event – as in fact happened a few years later in 1565. More storage silos were added wherever space for them could be found. 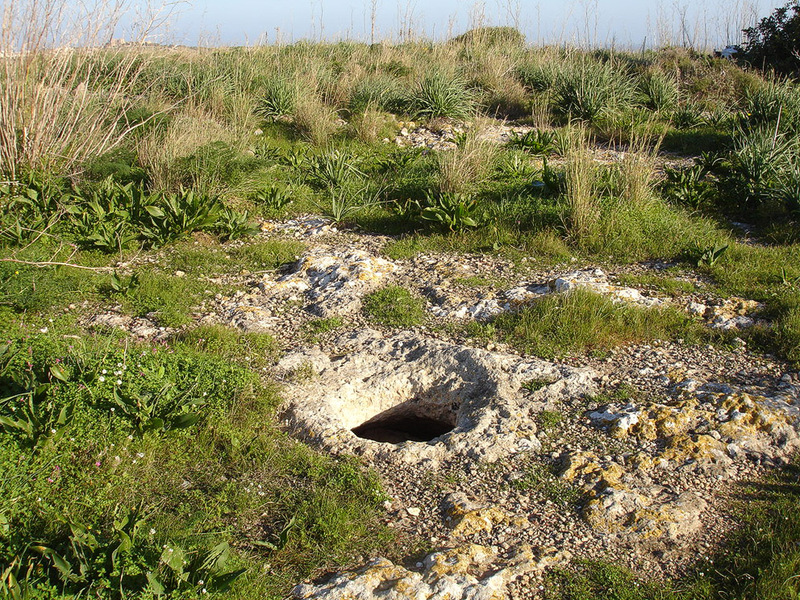 The first ones in the new capital Valletta were dug close to Fort St. Elmo some 350 years ago and a few are still extant. But the largest concentration of storage silos is (appropriately) the one at The Granaries in Floriana where they number 76 in total. These granaries are quite large and each could store from 50 to 500 tons of grain. If properly sealed grain could be stored for up to three to four years. Long after the Knights had gone the Granaries were of vital importance during the Second World War, when wheat shipments from convoys were quickly transferred here for safety. Although the nearby church of St. Publius was completely destroyed by the Luftwaffe in April 1942, incredibly the more strategic granaries were largely spared. The granaries continued serving their purpose until 1962, when modern storage silos were built elsewhere. Peacetime has turned the Granaries into a venue for mass events. Both main political parties organise huge election time mass rallies here and the phrase ‘imlejna l-Fosos’ (we filled the granaries) is a frequent boast. Election win celebrations are normally also held here by the winning party. In more recent years the square has witnessed the first Papal visit to Malta by the late John Paul II in 1990 and concerts by the like of Elton John, Mark Knopfler, Rod Stewart and Ronan Keating. Maltese tenor Joseph Calleja holds an annual (free) concert here. The Granaries have also become the venue for the Islands’ largest free musical event, the annual Isle of MTV Concert, and past editions have seen artistes of the calibre of Lady Gaga gracing the stage. This year the concert was held on Tuesday 7th July and featured Martin Garrix, OMI and Jason Derulo in the line-up. Thank you. That was very informative. The best piece I found on the net.